Choice Band (Guardians Rising, 121/145) wrapped its way into the game through the Guardians Rising expansion set. This card allows you to do an additional thirty damage to your opponent’s active Pokemon. It’s become one of the most popular cards in the game. Decks in Memphis averaged 2.40625 Choice Bands per deck. 28 of the top 32 decks ran at least one copy. Every deck in the top thirty two ran multiple GX Pokemon, so teching this card in was a no brainer in most decklists. With a Choice Band, you only have to do 140 to OHKO Tapu Lele. As I harped about last Friday, Field Blower counts are way down, so there’s a really good chance that that Choice Band isn’t going to get knocked off before you get to use it a couple of times. This card’s usage has remained consistent as well since its debut at Seattle back in May. It was in every top eight decklist then, it was in every top eight decklist in Memphis, and it has been in almost every top 8 decklist in between – the couple of Volcanion decks that have top eighted Hartford and Vancouver were the only decks that didn’t run Choice Band. Personally, I sometimes put it in my Volc decks and sometimes don’t. I would right now because of how many GX’s are out there, but I might use FFB instead in February because there’ll be so much metal out there you won’t need the extra thirty damage as much as the plus forty HP. Great card and (unlike Field Blower) there’s no debating its value in the game today. Really, the only debate is why it isn’t a four of. And as GX’s aren’t going anywhere anytime soon, I would expect to see this card get just as much use in 2018 as it got in 2017. The attack in question does damage in the first place. The attack is damaging the opponent’s Active. The opponent’s Active is a Pokémon-EX or Pokémon-GX. This is far simpler than it sounds, and not a new concept to the Pokémon TCG; Choice Band is simply a better Silver Bangle, a Tool that also added 30 damage under similar circumstances, except only against Pokémon-EX and with a clause preventing you from attaching it to Pokémon-EX. Choice Band first released in SM: Guardians Rising, back in May, so it was legal for the last few months of the 2016-2017 Championship Series, as well as all of the current 2017-2018; though it missed a little over the first third of the year, this has been plenty of time for us to see how useful Choice Band can be. This hasn’t been a friendly year for Item cards, and Field Blower released alongside Choice Band, yet Choice Band quickly became (and remains) widely used in both the Expanded and Standard Formats, more or less a staple in Standard and a loose staple in Expanded. Why? The current metagame is such that the vast majority of competitive attackers can OHKO single Prize Pokémon reliably, but the +30 damage increase when attacking most Pokémon-EX/GX is needed to avoid 3HKO scenarios, and sometimes to secure 2HKO’s or OHKO’s. This is why Muscle Band, doing only 10 less damage and working regardless of whatever the opponent has Active, has seen its usage plummet. The next most likely rival, Fighting Fury Belt, is in a similar boat, except with the formats swapped: a little usage still in Standard, but nearly extinct in Expanded. For the Limited Format, Choice Band is an okay pull. It isn’t super good because decks are less reliable in this format so you’ll probably need to luck into it at the right time… but that applies to almost everything in the Limited Format. The real reason I can’t rave about it is that most of your opponents won’t have Pokémon-GX. When it does its thing, though, its brilliant even here. Choice Band was ranked the fourth best card of SM: Guardians Rising by the collective CotD crew and took third place on my personal list for that set… which paints an inaccurate portrait. It is a great card, but it released in the same set as cards like Field Blower, Garbodor (SM: Guardians Rising 51/145), and Tapu Lele-GX (the three cards that outranked it in that Top 10). Had it released in another expansion, it probably would have taken first place. I had it as my fourth place pick, and the three cards I ranked above it are going to show up later this week. Choice Band in the video games multiplies your raw physical attack stat by 1.5, and somehow, the TCG seems to be able to implement a similar notion……….by increasing the damage you do to Pokémon-EX and Pokémon-GX by 30! Pokémon-EX and Pokémon-GX still makes a strong presence and it’s nice to find a way to break through the EX’s/GX’s absurd amount of HP. Factor in the Pokémon’s x2 weakness on top of Choice Band (because it boosts damage BEFORE applying Weakness and Resistance), and EX/GX aren’t that bulky than their HP suggests, even 250! The damage boost didn’t change from a 3HKO to a 2HKO or if it still fails to OHKO the target. The Pokémon in question is not a Pokémon-EX or Pokémon-GX. There are plenty of good one-prize Pokémon such as Greninja BREAK and Night March. Besides those two hiccups, this is still a great card to consider if your goal is to hit hard and land early KOs. Even with Field Blower discarding tools, this direct Pokémon Tool card is one card where you can make use of your turn. It is of no surprise that Choice Band would be on the list of the best cards of 2017, much like how Muscle Band and Fighting Fury Belt had placed themselves very highly in the end of their year. Kinda wished I had this on the list, but this year’s cards made me make difficult decisions! Afterthought: Since there’s a Choice Band in the TCG, I wonder if there’s a Choice Specs in the TCG. 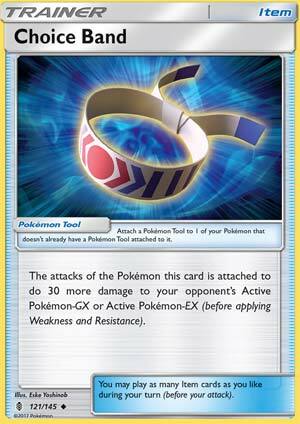 Maybe an effect would be a similar boat to Choice Band, boosting your damage output by 30, but on non-EX/GX Pokémon. That would pretty much make one-prize attackers unplayable! Extra damage are always appreciated as they allow you to get more damage without spending a lot of resources in order to do so. Cards like Silver Mirror (BW PLS), Muscle Band (XY Base) and Fighting Fury Belt (XY BKP) saw huge amounts of play as it did just so. Even cards like Giovanni’s Scheme (XY BKT) and Professor Kukui (SM Base) also saw play, even though they are Supporter cards which can only be played once a turn and often infrequently, because of this regard. And now, there’s a new card in town that does just that, and it also sees as much play as its predecessors. And that is Choice Band! This very lenient Pokemon Tool card allows you to deal 30 extra damage. But, its name has implied; it’s a choice item. But unlike the in game counterpart which locks you to one attack, this Item card only turns up the wick against Pokemon-EX and Pokemon-GXs. So it is choiced against attacking 2 prizer Pokemon only, and it does the job wonderfully! All decks run a heavy count of Choice Bands not just to give you the option to deal extra damage but also to interact with various Pokemon attacks and abilities as well. Such examples include the commonly stated Garbodor, on which Choice Band can be an emergency tool to activate Garbotoxin. Greninja BREAK decks loved Choice Band to deal up to 110 damage with Moonlight Slash, something it desperately need to help feed off its Giant Water Shurikens. The rarely seen Gourgiest (SM CRI) used it to deal extra damage with its Pumpkin Bomb attack. All EX and GXs used this to deal more damage in the mirror 2 prize match. Its simple, but aren’t the most simple Tools the best? If there is anything bad with it, is the fact that it competes for space in decks. As it is very splashable in many decks, players often found themselves in a dilemma about the number of Choice Bands they want to use. Silvally-GX (SM CRI) also wants its Memory Card tools to hit for Weakness damage, but it also wants Choice Bands to do more in other matchups. Big Basic decks like Volcanion-EX/Turtonator-GX also wants Fighting Fury Belt in some matchups to avoid one shots, but it also wants Choice Bands for extra damage. All decks also run Float Stone at the moment, and you can’t simply flick over the Float Stone away for a Choice Band and vice versa, which makes it very annoying at times. Overall, Choice Band is an amazing item that sees universal play and I believe will continue so until the death of it in the last Expanded rotations, which I believe will not happen for a long time. #5 Choice Band – the definitive Tool of the game right now, Choice Band made an enormous impact being a superior version of Muscle Band, just limited on hitting EX/GX instead of applying a flat damage buff against everything. It makes it not only a great Tool to have on-hand, but it also makes it a generally great option; unlike Muscle Band, which out of sheer utility you ran at 4, Choice Band is more flexible depending on the format being overrun by EX/GX or not, and that means it doesn’t need to have 4 spaces dedicated in every deck, and that makes it an incredible card to have in the format period.